The pattern calls for smaller needles and a tighter gauge. The cotton yarn is so inelastic and hard on my wrists and hands that I had to use a looser gauge. The seams are bulky. If I knit this again, I'll figure out how to do it in the round. I would use a more elastic yarn. Attaching the i-cord ties was a bit of a pain, and I would recommend not using contrasting ties (just to simplify weaving in ends and sewing). For a girl's version I might use ribbon instead of i-cord. If you want some contrast, it would be cute to knit contrasting cuffs and hem and maybe collar rather than the ties. The sleeves taper to the cuff; next time I would cut down on the tapering. Elizabeth Zimmermann notes that babies' and children's are practically the same circumference all the way down. I drink a lot of smoothies in the spring and summer, especially when it's too hot to cook. Smoothie + hummus + pita = instant, easy meal. It even covers most of the food groups! Usually I gather up whatever frozen berries I have, add vanilla or fruit yogurt, and whatever juice is around. This morning I came up with a delicious new concoction. The secret is the coconut milk. I often have coconut milk leftover from Thai recipes, and I never know what to do with it. I don't usually go in for miniatures or doll houses, but this is truly amazing. 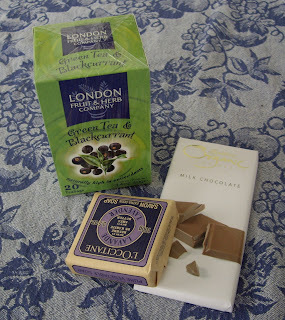 Diane sent me a lovely package from across the pond. She's a Canadian living in Dublin, lucky girl. Just think of the acccess to Magners cider, Guinness, sheep, and wool... I'm so impressed by her artistic talents on this little card! She put sweet little tags on all the yarn, including some DB Cashmerino Aran for a pair of Fetching mitts, which I'm dying to knit, as well as some Kilcarra Aran Tweed, spun in Donegal, and even some of her beautiful blue handspun! This will make a beautiful edging on a larger project, I think. The UK magazine Knitting has some great patterns. There's also some cute country-style fabric to make a mini quilt and pillow (doesn't show up well in the photo, though). And the treats? Quite lovely, indeed. I can personally vouch for both the tea and chocolate as quite delicious. I always love anything from L'Occitane, too. So decadent. Thanks again, Diane! What a lovely surprise on a grey, work-filled day. Not that Capricha is very happy about me working at the computer. 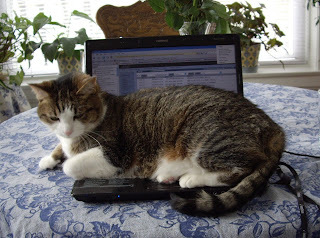 Good ol' cats, always looking for attention. I've started a somewhat secret project that's appropriate for project spectrum, so here's just a sneak peek. 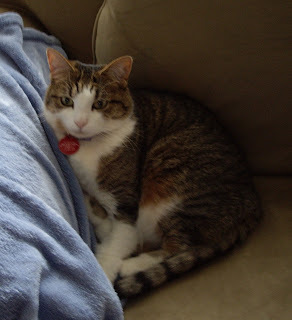 Gratuitous Capricha cat photo in honor of Friday. Who could resist a sweet little face like that? She looks so earnest. I'm halfway done seaming the Baby Yoda jacket. There are still many inches of i-cord left to knit, so an FO post will have to wait until the weekend. Knitty surprises are up on the web! Nothing caught my eye, but it doesn't hurt to check it out. If you're still panting for more, Knitting Philistine posted oodles of fabulous sock patterns yesterday. It's time for baby knits! 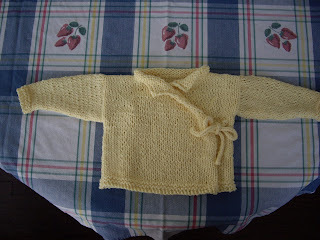 Two friends are expecting in June, and I would love to shower them with some handknit baby goodness. There's a Baby Yoda Sweater underway. I've finished the left and right fronts and the back. It's a quick and easy knit so far. I'm knitting with cotton again despite having sworn it off. I'm knitting from the stash, and the Bernat Cottontots is such a lovely lemony yellow (not that you can tell from this crummy photo). The yarn is leftover from this blanket. My gauge is a little loose since I'm using size 7 needles rather than the recommended 6s, but I just can't knit this yarn on size 6 needles. I'm developing a bad case of knitter's claw as it is. Young Jedis prefer natural fibers, you know. Acrylic interferes with The Force. I finally rediscovered the free online pattern for the sweet little bunny beanie I made back in December. Here's the link. I have enough yarn leftover to knit another! The picot edge was a bit fiddly. This was definitely a favorite song at the time. Smashing Pumpkins performed a great, free outdoor show at the Minneapolis Aquatennial. Then-mayor Sharon Sayles Belton even officially proclaimed it "Smashing Pumpkins Day" in the city. What 90s fashion trend did you most eagerly participate in? Now that's a tough one! Doc Martens, flannel shirts, and baggy jeans were the main staples of my wardrobe, but I wore ALL of those things in 1996, except maybe the colored jeans (I think those were big in 1992-93, not 1996). So comfortable, so Seattle. An Amazon package arrived on my doorstep over the weekend. All three books are very engaging, each in their own way, of course. 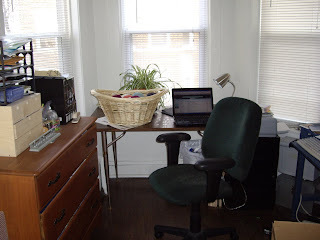 The Crafter's Companion offers a unique window into the craft-blog world. The photography is lovely, the writing is heartfelt, and there are some nice projects, especially the market bag. 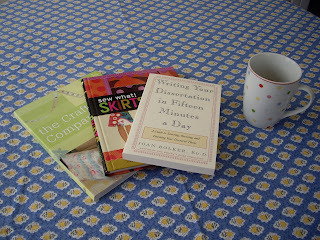 Write Your Dissertation in 15 Minutes a Day immediately admits that you need to spend more time than that, but it is a catchy title. It's a useful book that also manages to be comforting . Time will tell if Sew What! Skirts (I just hate that punctuation) can help me overcome my fear of sewing garments. I love the idea of it, though, since my favorite summer casual wear consists of fairly plain, knee-length skirts in a pretty print. Helene Grimaud, the French pianist, was absolutely marvelous as she performed Schumann's Piano Concert in A Minor with the Chicago Symphony Orchestra last Thursday. She made quite the impression as she walked out onto the stage wearing an ivory halter top and black satin yoga-type pants with her hair in a ponytail. I liked her combination of no-nonsense practicality (who needs long dangly sleeves on your piano keys or hair in your face) and rebellious sexiness. NPR featured an interview with her a while back -- apparently she's very into wolves. I'm including a delicious, easy, and quick curry recipe that we made on Saturday. Start your rice first! Either make coconut rice or plain long-grain or basmati rice. Rinse and drain the rice. In a saucepan on med-high heat, saute the rice, turmeric, and salt in the oil for a minute or two, stirring constantly. Add the water and coconut milk, bring to a boil, cover, and reduce heat to low. Simmer until the rice is tender and the liquid absorbed, 15 to 20 minutes. 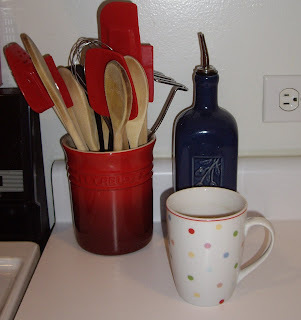 A very cute polka dot mug caught my eye while I was shopping at Target today and came home with me. Quite similar, indeed. Target even pulled together coordinating florals and stripes a la Cath, although the Target florals are godawful, IMHO. I have mixed feelings about this. Discount stores are always trying to keep up with trends and make stylish items available to the masses. Besides, polka dots aren't exactly an innovative design. I certainly wish there were a Cath Kidston shop in Chicago and that the prices weren't so high. Cath Kidston isn't a huge name here in the US, and she doesn't have a huge industry behind her. Not too long ago Ashley posted about Target carrying knockoff designer fabric bags, so apparently this is a trend. I appreciate Target's low price point, and I'm a native Minnesotan and loyal customer, but I'm less than thrilled. On the other hand, Target actually has made a deal with Rachel Ashwell to carry a lower-end version of her Shabby Chic line. This seems like a great AND responsible idea. The quality on the Simply Shabby Chic products is fairly high. There's also the Target/Isaac Mizrahi deal. Any thoughts? This is Kylie Cat's customary Sunday-morning pose while Paul and I sit at the table and read the paper (and drink plenty of coffee). Doesn't that look tempting? 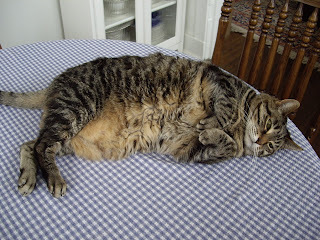 Doesn't it look like she's just begging for you to pet her fluffy tummy? Appearances can be deceiving, because she most certainly is not. Once you put your hand nearby, she attacks with vigor. Crazy kitty. Please pardon the prolonged silence. Cable internet disastre struck casa Caffeinated Yarn last Friday, and it has not been resolved yet, despite three visits from the cable guy (including one marathon 5.5 hour session on Tuesday). Good grief, to quote Charlie Brown. Knitting has occurred, some of which fascinated the cable guy as we watched the Cubs game while awaiting the arrival of yet another cable guy. The Falling Water Lace Scarf is just waiting to have its ends woven in and a good blocking. I loved the pattern and the yarn. I'll post full details post-blocking. A basic garter rib sock (from Sensational Knitted Socks) is on the needles. I'm using Cider Moon's Glacier yarn in the colorway June Carter. Very pink/yellow/green for Project Spectrum, no? 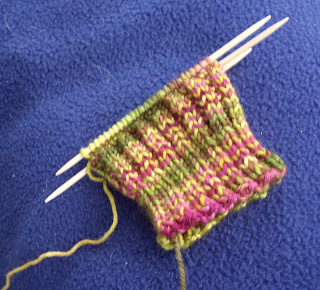 Despite following the gauge chart, I found that casting on 56 stitches made for too loose a sock. I went down to 48 for my narrow feet and apparently quite slender ankles. Paul: It looks very dainty. Jodi: What do you mean by that? Paul: It reminds me of tissue paper. 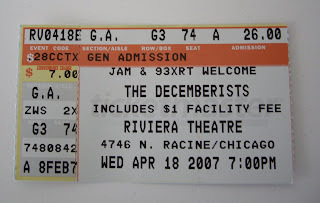 Colin Maloy and the rest of the Decemberists crew. Paul was there, too, along with a few thousand fans. The show was OK, but a bit of a disappointment in comparison with their stop in Chicago last fall. Methinks the band spent a bit too much time drinking at the Green Mill jazz club across the street before the concert. They played many songs from Castaways and Cutouts, but it was a fairly short show. One disappointment was a rather lackluster version of "O Valencia!" They did play the much-requested Mariner's Revenge Song as an encore. That one doesn't do it for me, in part because they ask for audience participation. That always makes me squirm, and my inner Cure-T-shirt-wearing, silently-rebellious teenager rears her ugly/non-participatory head. There's all sorts of excitement brewing in the blogosphere. 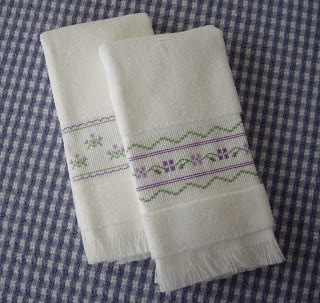 - Alicia has posted a free pattern for a very cute crocheted baby blanket. I just love Alicia's blog; she comes across as one of the nicest, most charming, and most interesting people in the world. Plus she has some darling pets, including a Welsh cardigan corgi! No, I'm not a stalker, just a loyal reader. - Alison is organizing Sockapalooza 4, and sign-ups are open. Yes, I have signed up for this one. - I can't wait for Alison's Harry Potter knitting book, Charmed Knits, to hit bookstore shelves. There's already a KAL organized, complete with a charity hat knitting project underway. 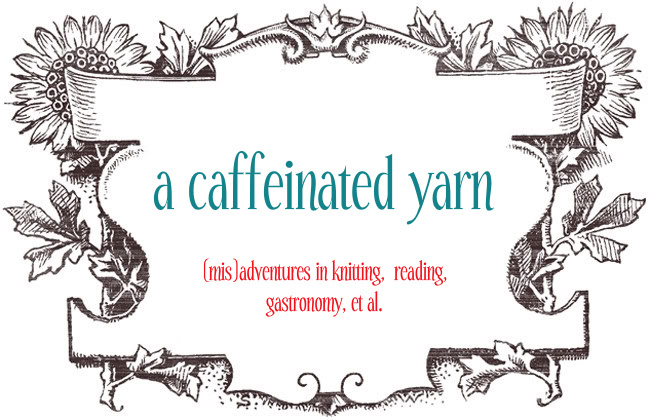 I just downloaded the free pdf, and I need to look through the stash for some suitable yarns. 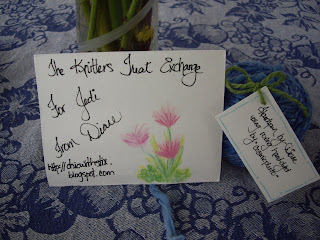 - The Knitter's Coffee Swap is taking place again. It was great fun last time, but I'm going to pass, what with the whole "saving my pennies" resolution. There's not too much excitement going on chez Caffeinated Yarn aside from an excessive amount of academic reading and writing. I'm embarking on a couple major ventures, though. Once again, I'm inspired by Alicia. I picked up a whole bunch of Debbie Bliss Cashmerino Chunky at a great discount. I just love the colors. I'm thinking either a ripple afghan or the Vintage Vertical Stripes afghan. 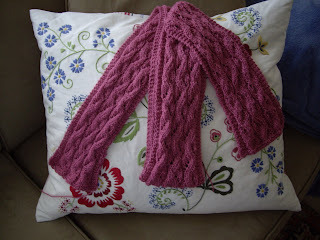 Check out the fabulous No-End-In-Sight Ripple-Along and the tutorial over at Bella Dia for inspiration. This is my last big yarn purchase for a long time, though, my friends. 2. Knitting (and crocheting) from the stash. Lots of lovely yarns are sitting in my stash, forlorn and just dying to be turned into something beautiful. Like I said, I'm making a concerted effort to save money (car fund / house fund / student loan payments), and cutting out the yarn buying is a great place to start. Here are my guidelines. 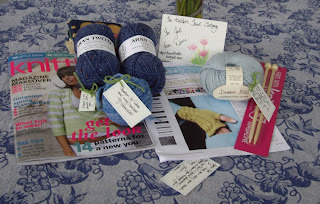 - I shall knit and crochet from my stash from now until the end of August. I shall re-evaluate my stash at that point. 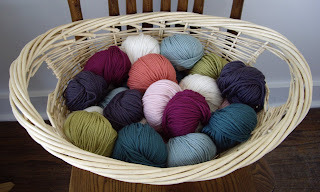 - I can buy yarn to finish up a project if I don't have quite enough. - I have one "get out of jail free" card. - I can buy yarn as a souvenir when I'm on vacation. Trips to Minneapolis and Milwaukee do NOT count as vacations. - I can buy yarn for my current swaps and Sockapalooza. - I can happily accept gifts of yarny goodness. 3. Reorganizing the study/craft room. Yes, I'm finally doing it. In the spirit of full disclosure, I'm posting some before pictures that are actually quite embarrassing. Hopefully the embarrassment will be motivating. Here is the free space created by getting rid of our guest bed. 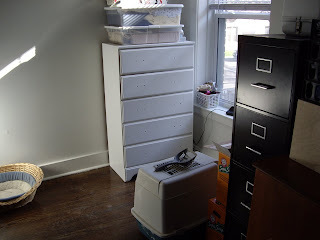 The dresser is for yarn storage. I may paint it blue, and I need to get new hardware. A craft cupboard is also going in this region. Unfortunately the litter box must stay. The main workspace. Quite the amalgamation of crappy furniture. This is my parents' kitchen table from the 1970s. The office chair arms are broken and bits of foam fall out from time to time. The cats use it as a scratching post. It needs to be replaced. The antique dresser is actually nice and will move to a different area. 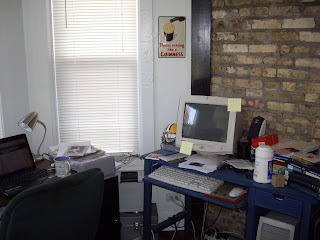 That dinosaur of a desktop computer is a genuine year 2000 Compaq masterwork. It still runs with the help of an external hard drive, additional memory cards, and an external hub for USB cables. It is affectionately known as Frankenputer. It needs to go. So does the blue desk. A pile of boxes, an extra end table, and just a few of our bookcases. 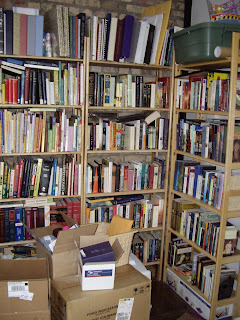 These contain fiction and literature, craft books, law books, and library books. No classics book or non-fiction -- those are all in the living room. They need to be moved and reorganized. The worst part of all this is that I genuinely feel that I am an organized person. Judging from this room, that seems like a big fat lie. Being in this space makes me CRAZY. So instead I work at the dining room table and close the door to the study when people come over. In a 900 square foot apt. that is ridiculous. If you ever wander through a Roman cemetery or catacombs, you will notice the inscription S T T L. Sit tibi terra levis. "May the earth be light upon you." That is my last wish for Kurt Vonnegut. The earth seemed heavy and screwed up to him, perhaps rightly so. His gift, though, was to make light of these thing in a way that made people think, reflect, and reconsider. And laugh. Vonnegut was one of my favorite authors when I was in high school. He gave a lecture at my ollege when I was a sophomore, and it was quite the experience for me. In a way it was a sad experience for me, for Vonnegut had turned into a crotchety old man. Critique and satire had become complaints. But perhaps this is the difference between reading a book and meeting the man? Perhaps writing is a way to crystallize complaint into commentary? When they were inducted into the National Institute of Arts and Letters in 1973, Kurt Vonnegut said of Allen Ginsberg: "I like 'Howl' a lot. Who wouldn't? It just doesn't have much to do with me or what happened to my friends. For one thing, I believe that the best minds of my generation were probably musicians and physicists and mathematicians and biologists and archaeologists and chess masters and so on, and Ginsberg's closest friends, if I'm not mistaken, were undergraduates in the English department of Columbia University. No offense intended, but it would never occur to me to look for the best minds in any generation in an undergraduate English department anywhere. I would certainly try the physics department or the music department first -- and after that biochemistry. Everybody knows that the dumbest people in any American university are in the education department, and English after that. "No offense intended," indeed. That takes cojones, my friend. 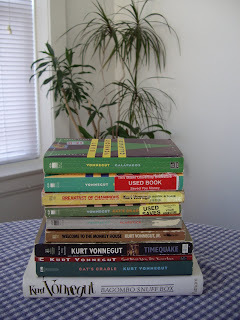 And those are something Vonnegut always had. When I got home on Monday there was a surprise Easter package from my SP10. 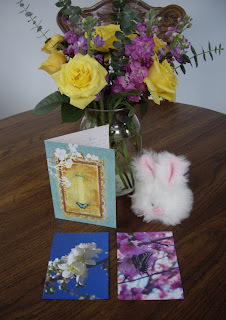 She sent me a cute fluffy little bunny, plus some beautiful spring photographs and a card. She's quite the photographer. I'm putting these up on my bulletin board to help me think of spring. Snowflakes have been swirling through the air for the past few days, so spring has seemed a bit far off. Thank you! I stitched borders on these guest towels. They're a gift; they're not exactly my style, but I think that the recipient will appreciate them. Progress is being made on my sampler now that my embroidery floss order has arrived. If all goes well I'll post my first FO for this round of Project Spectrum within the next couple days. Now I know what to have my students call me! I prefer to be on a first-name basis, but this drives some of them batty. I'm about to head up to Milwaukee for the Easter holiday, but I want to send out a great big thank you to my SP10. An awesome package showed up on Wednesday. 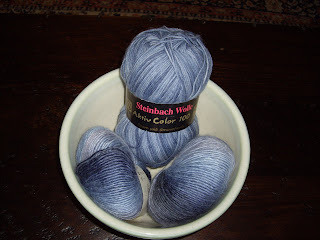 Beautiful blue yarn -- Steinbach Wolle sock yarn, and Rowan Tapestry, which I have been drooling over for a long time. It's so pretty, and the soy gives it a really neat texture/hand. What else? 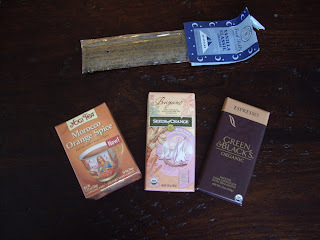 Some orange herbal tea that looks delicious, fancy chocolate (one Green & Black's -- pure luxurious yumminess), and some vanilla incense. She even made me some jewelry! I never branch out into jewelry making, so that's a treat, too. I think I'm scarred by the memory of overturning an enormous box of beads from a grade school project and having to pick them ALL up. 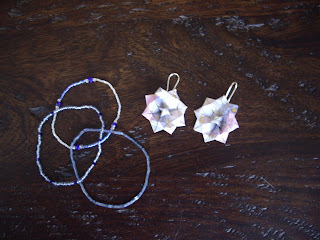 The earrings are made of origami paper, I think. I've been experimenting with crochet for the past couple days, and I'm not ready to show the fruits of my labor to the WWW quite yet. I think I need to work on my tension a bit. On a more random note, check out this NYT headline. Does this make anyone else think of Monty Python and Arthur, King of the Britons? Not too often these days do you hear UK residents described as Britons. Gotta love the NYT. Speaking of the NYT, did anyone else read this article about Tabasco sauce over the weekend? One might think that an article about a condiment company would be dull, but this most certainly is not. My favorite bit is the heavy toll that the hot sauce barrels take on the company forklifts. I'm tempted to move to Avery Island. Apparently I'm on a lucky streak (remember I just won a signed copy of a Yarn Harlot book in Chris's recent contest), since I'm also a winner over the Cider Moon Yarniversary contest. I ganked the photo from the website -- it's so pretty! 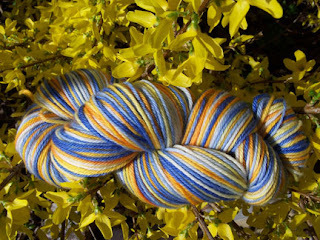 I've gushed about Cider Moon yarn before. 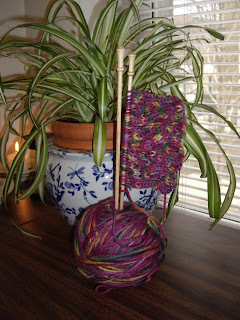 I loved knitting my "Winter Twilight" Cider Moon socks, and I have stashed away a good bit of their sock yarn. This is a good thing, since quite soon they have to raise their prices a bit due to increased costs on their base yarn. If you're looking for serious knitting content, you're out of of luck once again. Too much time has been spent studying as of late. 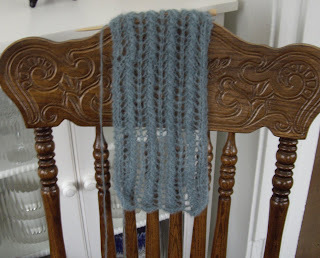 I have updated the link for the Falling Water Lace Scarf pattern from two posts ago. Thank you for all the birthday wishes and kind get-well wishes for my grandmother. 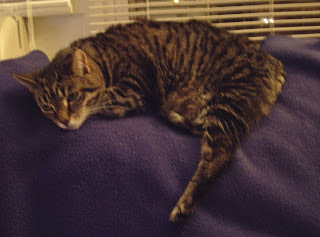 Her health is improving, which is a real relief. My birthday celebrations were low-key but quite nice. The only downside is that Paul developed a nasty case of food poisoning. I blame it on the take-out pasta we had for dinner. We also learned that our cats do NOT like toddlers. There was plenty of hissing, hiding, and terror. The peanut butter cupcakes were delicious, but the milk chocolate glaze didn't turn out so well. I learned to trust my instincts rather than the candy thermometer on that one. 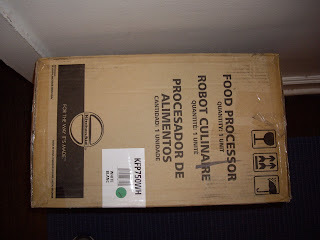 A new "robot culinaire," as the French call it. I think a "robot culinaire" should be able to do far more than chop up veggies and whip up some pesto. It should more closely resemble Rosie, the maid on the Jetsons, and cook up entire gourmet dinners! We're going Kitchen Aid this time, since I managed to wear out / break my Cuisinart (which was a wedding present less than 4 years ago). - Buttony - Heidi just finished a really cute one; Leah knit a great, slightly less buttony version a while back. I'm a bit hooked on swaps lately. I like getting to know new people and trying new crafting ideas. This is my last swap for a while, though, since I'm saving my pennies for a newer, less high-maintenance car. On a related note, I highly recommend never buying a 2001 Chevy Malibu. Look at all the colors! I naturally gravitate toward blue. 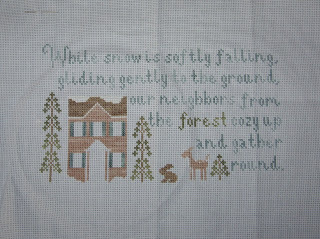 I cross-stitch and sew a bit. I'm slowly learning to crochet. 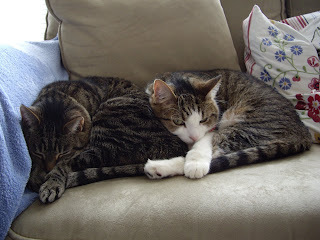 I would like to learn needle felting, and I would like to improve at sewing and quilting. Interweave Knits, Martha Stewart Living, Cottage Living, Country Living, Midwest Living, Blueprint. Socks, hats, scarves, baby sweaters and blankets. The usual hay fever suspects, smoke, dogs, cats (but I have two cats nonetheless). I'm allergic to Bath and Body Works' Flowering Herbs products. Something natural -- citrus, almond, milk, lavender/vanilla combinations. The tea room, for sure. A cup of fruity black or green tea. The old fashioned bakery, where hopefully I will find an apple fritter or a scone or an almond-filled croissant. I love trying new things and getting mail. Blue is my absolute favorite color, but I also like lavender, plum, sage green, cherry red, dark chocolate brown, and neutrals. I'm not a fan of orange, yellow, olive green, or bright pinks.